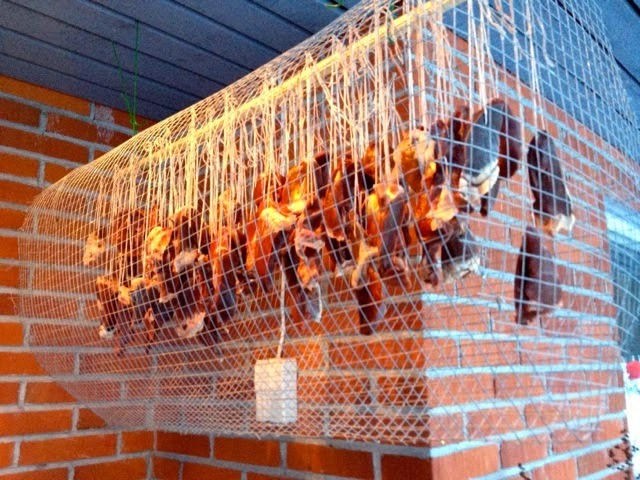 It is the season to prepare a Lappish delicacy, air-dried reindeer meat. Yesterday I bought 5 kg reindeer hearts (yep, the inner organs) and put them to a salty water for one day (salt percentage around 6). After that I let the meat pieces hang in the spring weather for 2-3 weeks. The best weather for drying meat is when we have some plus degrees during the daytime with sunshine and some minus degrees during the nights! This variation of the temperature "pumps" the liquids out the meat and hence we get air-dried reindeer meat. In addition, dry windy weather helps! 2-3 weeks and nam nam !!! I could really use some reindeer jerky right now. Could you mail me a few pieces? How did you manage to do such a professional job with the cage and the hooks? Or did you just take a picture of Toivo's jerky?